Expect more Baby-BOOM!ers to be adopted into the fold in March, with two new series on the way from BOOM! Studios. From Donald Duck to the Plutonian, each saucy little number comes wrapped in an even hotter cover - these four a handful of the best from their March line-up. 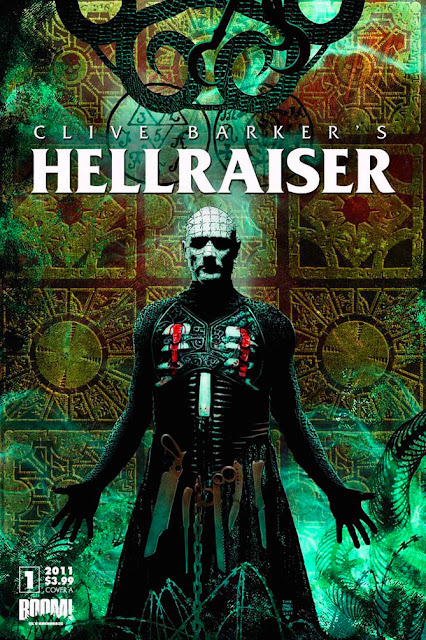 COVER OF THE MONTH: CLIVE BARKER'S HELLRAISER #1 - Leonardo Manco Face it, a chicken could've drawn this one and with Clive's name on the cover it would still spook the bejeebers out of you (never mind the fact it's a drawing chicken). So what do BOOM! go and do? Grab Leonardo Manco, whose 1000 times more talented than any old foul, and unleash his attention to detail all over the place. Pure poultry in motion. CLOSE CONTENDERS: Rael Lyra - Insurrection v3.6 #1, Gary Brown - Incorruptible #16, and Paco Rodriguez, Fabrizio Petrossi - Mickey Mouse #306. For all things in March that will make you go BOOM! click the jump. Hellrasier is definitely on my list. I loved the original movie back in the day. I've seen bits and pieces since and some of the FX really didn't weather the decades well, but what a concept! I've even got my model of the cube on my shelf at work. Thought you'd like that one Craig! I never thought of HR as a comic book concept but you're right it is a natural one!